April 11, 2019 at 3:18 am. 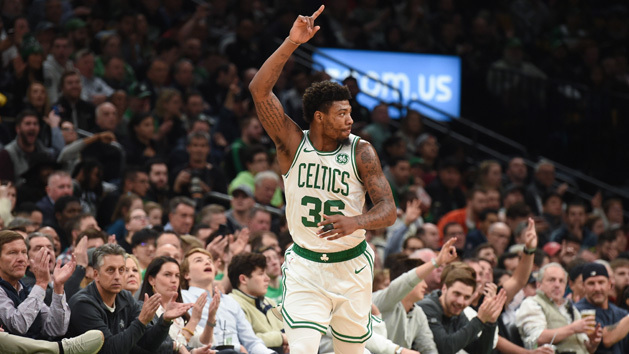 Boston Celtics guard Marcus Smart has a torn left oblique and will be held out of basketball activities for four to six weeks, the team announced Wednesday. That likely will keep Smart out of the first two rounds of the Eastern Conference playoffs. Smart averaged 8.9 points, 4.0 assists and 2.9 rebounds this season for the Celtics, who will be the fourth seed in the East postseason after posting a 49-33 regular-season record. Boston will open at home this weekend against the fifth-seeded Indiana Pacers. The physical guard is noted as one of the NBA’s top defenders. Smart sustained the injury in a game against the Orlando Magic on Sunday, and he did not play Tuesday at the Washington Wizards. The Boston Globe reported that Smart was in too much pain to undergo an MRI exam on Tuesday, with a Wednesday test confirming the injury. The 25-year-old Oklahoma State product started 60 of his 80 games this season.